January was a month of new experience for the kids and me. It was the start of 2018 and we were lucky to be able to try out the Luge and Skyride at night. 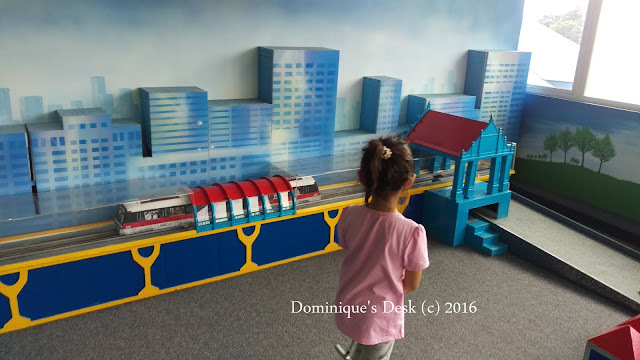 Ever since Skyline Luge Sentosa added on it’s night ride and new tracks the kids have been bugging me to let the visit the Luge so they can enjoy racing each other down the slope. We visited the place on a Wednesday night as I wasn’t too keen to jostle with the crowd on the weekend. It was extremely cooling at night especially after the rain in the afternoon. It was the first time that we were taking the Skyride at night and were blown away by the night scenery. Besides the lights from the ships and buildings from afar we were also intrigued by the neon lights that lit up the Jungle Trail and Dragon Trail which were below us. The view was so much better at night then in the day. When we reached the top of the skyride the kids couldn’t wait to get their helmets on before they started on the Luge ride back down to the bottom of the slope. I didn’t take any photos with the kids as we were racing down the slope as it wasn’t safe to steer the LUGE with one hand while negotiating the various turns on the way down. We had two rides down the slopes and during the first ride Tiger girl doubled up with me while her brothers went on a vehicle each. The Skyride Luge Sentosa has changed quite a bit since we were there 2 years ago. They recently added in two new tracks- the 658 metre long Expedition and 638 metre Kupu Kupu, which means “Butterfly” in Malay. We were keen to try out the new tracks and went down each trail once. The boys went off on their own while the girl and I leisurely cruised while making our way down. After a doubled up ride with me Tiger girl’s confidence was boosted and she was keen to do her first solo Luge ride now at 7 yrs old. 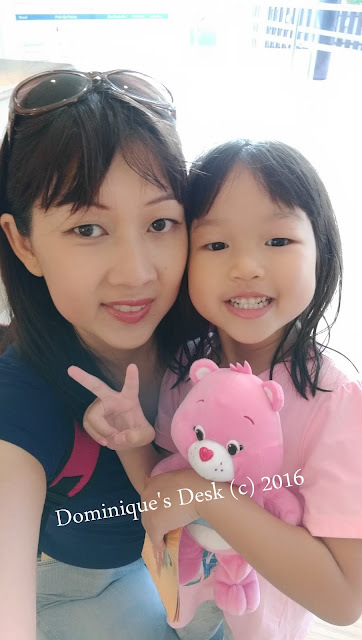 It was a milestone achievement for her handling the Luge on her own and she could maneuver the corners without much difficulty. I would had loved to be able to document her first solo ride but unfortunately wasn’t equipped with a GoPro attached to the helmet for easy videoing during our visit. Maybe next time!! The fun ended all too soon for the kids as they came to the bottom of the slope a 2nd time. They wanted to go for more rides but it was nearly closing time and with the next day a school day we had to head back home to make it in time for bedtime for all. It was a great midweek chill out activity for all and are looking forward to the next time where we be back for another few rounds on the LUGE. For more information do check out their facebook page. 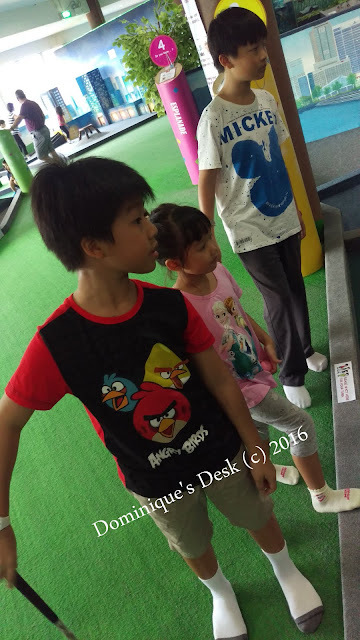 Disclaimer: The kids and I were invited for a fun time at Skyline Luge Sentosa. All opinions are 100% mine. Valentines Day was a day set aside by society to celebrate romantic love. This day has a different meaning for me as I believe it doesn’t have to be love between a man and women, but one that encompasses the whole family. The meaning of Valentines has been commercialized and as a result romantic love has been emphasized on instead of the love for the family which should be the true focus. This year I decided on doing something different and celebrate with the kids instead. What better way to spend the weekend then letting the kids try create memories from new experiences. 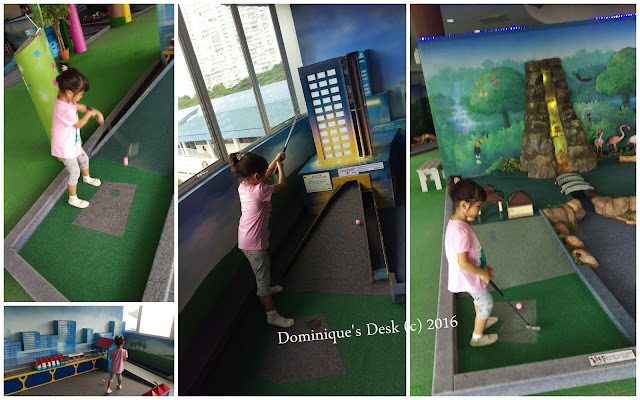 I brought them to Lilliputt to try out the 18-hole indoor putting range at East Coast Park. It was the first time that tried putting and they really enjoyed themselves. 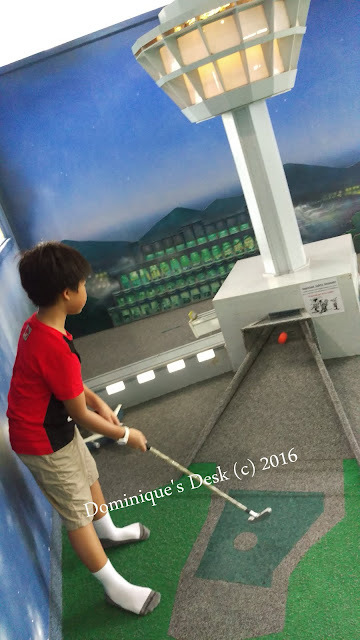 They were each given a colored ball and shown how to hold the putters properly. It was really interesting to see each hole decorated to look like various places of interest in Singapore. At most stations the kids have to guide the ball up a ramp so that it could go through the different pathways to reach the hole. It was extremely interesting as one no idea where the ball would go after if had enter the structure via the ramp. The ball could exit from which hole in the structure. Doggie boy found this particular station extremely amusing. He deliberately lingered at this station so that he could see the train transporting the ball from point A to point B several times. The kids took about 1.5hr to complete the 18 holes. 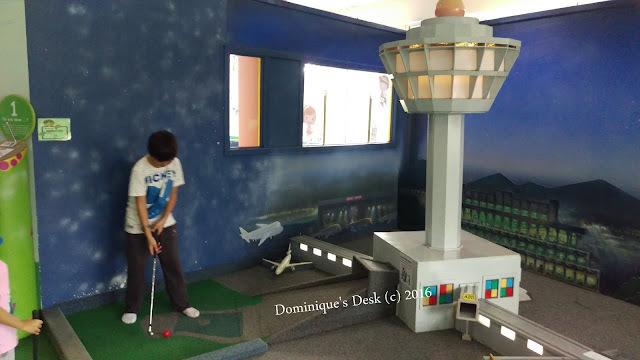 Have your kids tried an indoor putting range before?